Happy Spring everyone! 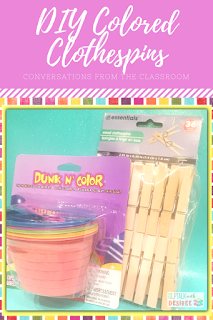 I just wanted to pop in to let you know about a quick DIY tip I blogged about over on Conversations from the Classroom using what you may already have! Hope on over to see what I crafted up using Easter egg dye and clothespins that I picked up from my local dollar store. Wow, it has been a while since I have hopped on here. If you have been wondering what I have been up to, here is a quick glimpse into some of the happenings in my therapy room (and beyond). We have been trying out these awesome Pop Phones. They are a great companion to the app Seesaw (a digital learning portfolio that I use with my students). Speaking of going digital, I used the No Prep version of my Cup Stacking paired with these rubber bunnies which was a huge crowd pleaser. While we are on the subject of Target, my home away from home, look at these fun mouth molds I found in the gag gift section! They were perfect to make dough molds of our mouths and compare/contrast target sounds. My graduate intern and I got our head in the game with the annual Staff vs. Students basketball game. We made it through the game with no injuries and our pride intact as the staff maintained our undefeated record. Phew! Last, but certainly not least, I was privileged to attend a balloon release to celebrate a special little Hall & Oates fan's birthday and educate others on lissencephaly. I hope that you have enjoyed a great month too! My students continue to be unstoppable and inspire me each and every day. Leave a comment below or email me to let me know what you have going on in your corner of the speech world. I'd love to hear from you!